* Crowds at yesterday's Children's Day on the field. * A group of Eisteddfod volunteers. 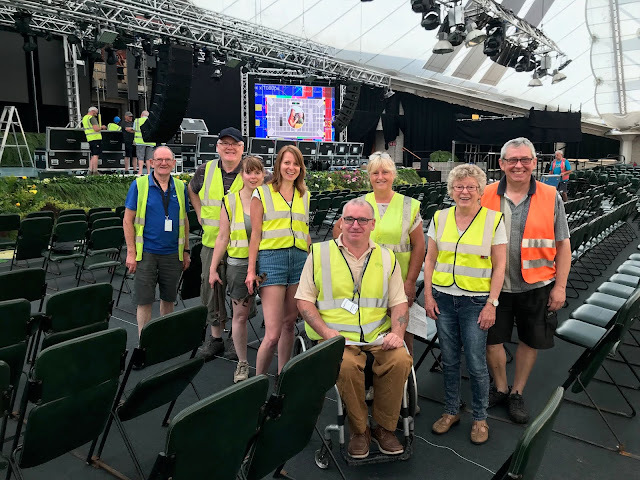 Eisteddfod week has now arrived and our trusted army of volunteers have been working flat out to get everything in place for an amazing event. The flags are out, the tents are up, the seats are in, the floral displays perfected and now we are all set for the arrival of our musicians and dancers from all around the world. The sights and sounds of the Eisteddfod will also spill out into the town with free performances taking place all week. We will be holding recitals @ 1pm in St Collen’s Church (Tues – Saturday inclusive) and the preliminary competitions will be running in the Town Hall, Dinas Brân and English Methodist Church. The Dancing in the Street competition will be in the Riverside Park from 2 pm on Saturday 7th. We are delighted that the works on Centenary Square have been completed in time for this week, and thank the Town Council for allowing us to use that space in advance of its official reopening and rededication (which takes place on Sunday 8th July). There will be international competitors performing in the Square everyday Tuesday – Saturday inclusive. The International Parade through the town will take place on Friday from 4.30pm. If you fancy soaking up the atmosphere of the Eisteddfod for a few hours, you can follow the parade back to the field and have entry for just £1 to enjoy the pre-concert bands until 8pm. All of the activities in the town are free so do take advantage of this and experience what the Eisteddfod is all about. We appreciate the support of two local businesses Fouzis and the Corn Mill who are our outreach sponsors this year. We are delighted that competitor numbers for this year are high and we will be welcoming competitors from the following countries: Albania, Australia, Canada, China, Czech Republic, England, Estonia, Germany, Ghana, Greece, Iceland, India, Indonesia, Republic of Ireland, Isle of Man, Poland, Scotland, Singapore, Slovenia, South Africa, Thailand, USA, Wales, Zimbabwe. Our Saturday programming is so full we will be starting the competitions in the main pavilion at 8.30am to make sure that the competitors all have the chance to take to the stage. Do come and support them if you can. Saturday will also feature a range of entertainment for families on the outside stages, activities run by NSPCC , circus skills, floral workshops and much more! Thank you to everyone who has contributed to this year’s event in whatever way, whether large or small, as without you this fantastic event would not happen. I hope to see you there!